Tata has launched the 2019 Hexa with a few feature updates and cosmetic enhancements. While the starting price remains unchanged at Rs 12.99 lakh (ex-showroom Delhi) for the base XE variant, the top three trims - the XT 4x2, XT 4x4 and the XTA 4x2 - have gone up by Rs 20,000.The 2019 Hexa gets a new 7-inch Harman-sourced touchscreen infotainment system with Android Auto connectivity. Other updates include diamond-cut alloy wheels in the automatic variants while the mid- and top-spec manual variants get new 16-inch Charcoal Grey units. Further, the top-spec variants can be had with dual-tone colours - Infinity Black and Titanium Grey - as well. The Tata Harrier is powered by a 2.2-litre diesel engine that puts out 150PS of power and 320Nm of torque in the base-spec XE variant and 160PS and 400Nm in all other trims. However, the base XE variant could soon be discontinued from the lineup. While the base variant is only available with a 5-speed manual, the others can be had with a 6-speed manual or auto ‘boxes. The top-spec XT variant is even available with four-wheel-drive as well. The prices of Hexa diesel variants start at Rs. 13.16 lakh and the top-end diesel is priced at Rs. 18.54 lakh. Tata Hexa is available in 7 variants and 5 colours. The claimed ARAI mileage for the Tata Hexa diesel is 17 kmpl. The Hexa comes across as a great package especially thanks to its competitive pricing. Also all variants are well equipped and it offers safety features like dual front airbags, ABS and EBD as standard across the range. Q. What are the side plastic clips in the third row seat of Tata Hexa? Q. I've heard the steering is heavy, is it comfotable to drive in cities? Q. What is the service cost per service and the intervals of Hexa? Q. Is it sensible buying XM varient? As we looking for 7 seater in Tata Hexa. Can the Hexa help Tata reclaim ground in the thriving SUV segment? 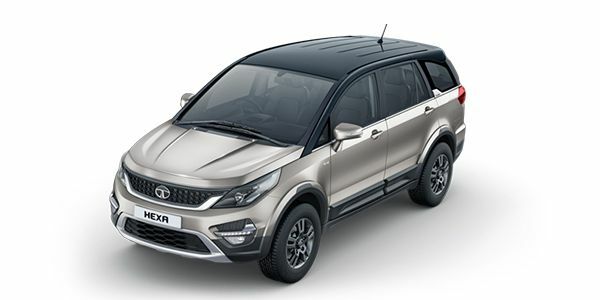 The Hexa MPV is one of the finest cars ever made by Tata Motors and the decent sales Hexa is churning even in the high price bracket of Rs 12.99-18.36 lakh (ex-showroom, Delhi) testifies its popularity among Indian masses. The styling of Tata Hexa is refreshingly clean and uncluttered although Tata has made sure that Hexa doesn’t look plain Jane and boring. The quality of the interiors is a big leap forward and is on par with the rivals. 2.2-liter turbocharged direct injection diesel motor in Hexa puts out 150PS/320Nm and 156PS/400Nm for the VARICOR 320 and VARICOR 400 iterations respectively. While the lower output is mated to 5-speed manual transmission, the higher version channelizes the power to the wheels via 6-speed manual and automatic transmission. Tata is also offering an all-wheel-drive version of the Tata Hexa pitted against the likes of Toyota Fortuner and Ford Endeavour. The Tata Hexa comes with a “don’t mess with me” vibe. From the front, its mean bonnet, the hexagonal front grille and projector headlamps create one helluva road presence. From the side, it is less imposing with its Aria inspired squareness, although it does stand tall with its 19-inch wheels. These are now available in a new diamond cut pattern for Automatic variants while manual variants receive a new charcoal grey design. The drop down elements from the roof and the blacked-out pillar gives it a distinct look which is enhanced with new dual-tone option in the Infinity Black and Titanium Grey top end XT variants. The first thing you will notice from the back are the chunky taillamps that wrap around onto the tailgate. And yes, there’s enough chrome to impress potential Indian buyers. The Hexa comes with the 2.2-litre engine we’ve seen in the Safari Varicor400. The four-cylinder engine makes 156PS and 400Nm of torque that’s available with either a 6-speed manual or a 6-speed automatic. The automatic variant felt easier to drive especially because the shifts were smooth. The manual variant’s clutch keeps you guessing at first, but it isn’t hard to get used to. It can now easily switch between the four different driving modes – Auto, Comfort, Dynamic and Rough Road, for increased comfort & stability over difficult terrains. This set of modes on offer are known as ‘Super Drive Modes’. The Hexa has six variants to choose from. While the base XE variant comes at a price of Rs 12.99 lakh (ex-showroom), the top of the line XTA (4x4) automatic variant sets you back by Rs 18.36 lakh. Mahindra XUV 500: The Mahindra XUV 500 is the direct rival to the Hexa. It’s ease of driving, fuel efficiency and equipment outshine that of the Hexa, but it takes a tumble when it comes to refinement, built quality and overall passenger comfort. Toyota Innova Crysta: Toyota has dominated the Indian market for over two decades, and the Cysta just proves us why. The extra 4 lakh premium offers you more punch across all parameters, which include better ride quality, reliability and dependability, and not to mention a great re-sale value. The Hexa looks mean and certainly makes an impression on the road. It is quite spacious and can tackle bad roads easily, and it is priced well. It is safe to say that the Hexa ticks all the right boxes with few minor compromises. Customers can drive away with a down payment of just Re 1 and avail discounts up to Rs 1 lakh!